Searching for Amish furniture in Massachusetts? While the Bay State has no Amish presence, MA furniture shoppers can find Amish woodworking both in-state and in neighboring states–at a reasonable drive from Boston, Worcester, Springfield, Cambridge, New Bedford, and other Massachusetts cities. Amish furniture has gained renown for its durable construction, high quality materials, and attention to detail. Solid hardwoods–oak, maple, cherry, walnut–combined with a range of styles, from Queen Anne to Mission to contemporary designs–make Amish furniture popular among buyers nationwide looking for high-value, quality furniture pieces. Amish furniture craftsmen produce items for every room of the house, including the kitchen, dining room, office, children’s room, living room, and even outdoor furniture. Featuring furniture from a number of producers, including Mennonite and Amish furniture makers. Furniture types include Colonial, Shaker, Traditional and early American styles. Carrying dining and bedroom sets, occasional pieces. To find Amish furniture dealers in neighboring states (RI, NH, CT), check the Amish Furniture Guide main directory page, with full listings of Amish furniture retailers in the US and Canada. Note to Massachusetts residents: Please be sure to check opening hours of any Amish furniture businesses listed in this guide before traveling long distances to visit them. While we strive to keep this directory up-to-date, business locations and availability can change. Not responsible for changes to information. Amish have long been linked to agriculture, known for operating small, labor-intensive family farms with limited levels of technology. The Amish furniture heritage has emerged over the past several decades in response to land pressures and an ever-growing Amish population. 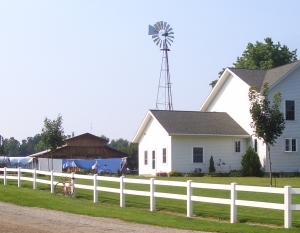 The Amish woodworking shop offers a way of making a living, a chance for Amish families to remain together (in some communities, Amish men spend much of the day away from home working in non-Amish factories, a situation seen as less than ideal), and for many Amish craftsmen, a creative outlet for talents. Amish furniture styles run the gamut from the traditional and classic designs (Mission, Shaker, Colonial) to modern ones. Amish woodworking enjoys a positive reputation for its durability, quality, and attention to detail. Dovetail joints, precision finishing work, and painstaking craftsmanship help Amish furniture stand out from the pack. Amish furniture is typically constructed in small, family-owned shops (as opposed to large-scale factory settings), lending a certain cachet to Amish woodcraft. Contrary to belief, Amish furniture craftsmen use a variety of technologies in their shops, often powered by an air or hydraulic system. The most conservative Amish furniture craftsmen use a drive shaft-and-pulley set-up which enables a number of machines, including saws, drills and planers, to be run from a single power shaft running under the floor of a workshop. Though some Amish entrepreneurs sell the furniture they make through on-site retail stores, Amish often work in tandem with non- Amish furniture sellers to market their products. Due to these partnerships, Amish furniture has become available in nearly every state. If you’re looking for Amish woodworking in the Bay State, options are relatively limited, with few dealers in-state. However, neighboring states also offer options for purchasing Amish furniture, with dealers in New England locations in Rhode Island, New Hampshire, Connecticut, and Maine. Since Massachusetts has no Amish population, and is relatively unlikely to see Amish immigrants to the state, if you’d like to purchase direct from the source, you’ll need to hit the road. The only Amish settlement in New England is found in Maine, home to 3 small Amish communities. In New York state, however, you’ll find the country’s 5th-largest Amish population, with numerous settlements found across NY, some within reasonable driving range of the Bay State. For those not minding a farther journey out of Massachusetts, Pennsylvania is well-known for its thriving Amish communities. Purchasing Amish furniture direct from the manufacturer can offer a unique and rewarding experience. Since Amish furniture craftsmen do a lot of custom work for their buyers, visiting an Amish workshop can be the best option for those wanting specific work done, outside of buying from a standard line of furniture via a Massachusetts Amish furniture dealer. Prefer to shop Amish furniture from the comfort of home? Try an online retailer.